Artist-in-residence of the Atelier Lyrique de l’Opéra de Montréal and grant bursary and graduate student at McGill University, Myriam Leblanc is a young soprano coloratura evolving in the musical environment over many years already. Recently, in 2014, she won the Public Preferred Talent Prize and overall First prize in the OSTR (Trois-Rivières Symphony Orchestra). She also participated along with colleagues singers in the 2014 Young Lyric Ambassadors and won several commitments and prizes, such as the Quebec-Bavarian Prize, as well as the Belgian Operatic Prize, which brings her to sing at the Silly Musical Spring Festival. In 2014, she was also noticed at the Prix DEurope where she won the Anisia Campos and Rémus Tzincoca prize for the best opera excerpt. Over and above the pre cited events, she also detains a Master’s degree in choir direction, acquired under the good guidance of the well known musical director, Robert Ingari. In 2015, she sang the title role in Roméo et Juliette (Jeunesses Musicales Canada) and was a soloist in several Atelier lyrique de l’Opéra de Montréal concerts. 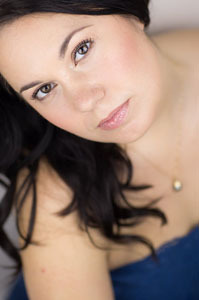 She makes her debut at the Opéra de Montréal singing the role of the High Priestess in Verdi’s Aïda as Caroline Rodgers from La Presse describes «a voice of a rare beauty.» She also sings the role of Micaëla in Bizet’s Carmen with L’Orchestre Symphonique de Longueuil , Donna Anna in Mozart’s Don Giovanni with Saskatoon Opera and Flower-girl in Wagner’s Parsifal with Festival de Lanaudière. In the 2017-2018 season she is Soloist for Edgar et ses fantômes 2, Soloist in Mozart’s Mass in C minor (Orchestre Symphonique de Montréal), Milica in Sokolovic’s Svadba (Opera de Montréal), Micaëla in Bizet’s Carmen (Opéra de Québec). In the fall 2018 she sings her first Gilda with Opera de Montréal.